Jesus models for us, in our lives, what life should be like. He shows to us the model of Christian life and faithfulness. Will we ever live as He lived? No likely. But, He shows us what we should aspire to. He shows us what we should chase after. We should all, in our lives, try to be like Jesus. And we get that in terms of loving, or serving, or forgiving. We understand that. Today’s passage, through, it gives us insight to what we should try to be like, in terms of our prayer life. Jesus prays that this cup pass from Him. Yes, He chose the cross. He knew it was what He must do. He knew it was God’s plan for redemption for humanity. He knew it was what was to come. And we see, that even while He chose it, He was not looking forward it. He was not excited about it. He really knew how tough it would be. So, He asked His father, if possible, let it pass. But, He said, not it be His will, but God the Father’s will. When your prayer life is hard, He understands. 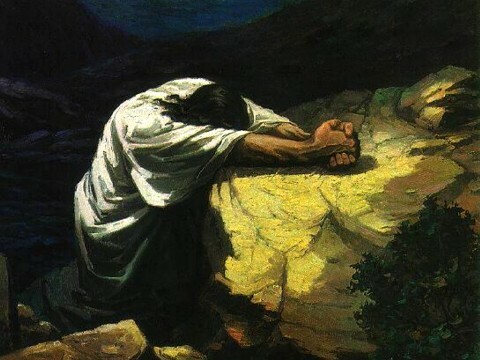 When you aren’t sure what to pray, He understands. When your prayer life is a struggle, He understands. When we struggle with life, when we struggle with challenges, when we deal with all types of problems, He understands. He’s been there. He’s been in the place where He asked God to take the cup from Him. But, how did His prayer end? Not what He will, but what God willed. Jesus went through the challenge and pain of the cross. He went through the pain of betrayal and hut. He went through all of this. And He emerged victorious. So will you. Be faithful. Pray. Trust. Hope. Lean upon Him. Know He’s been where you are. Trust in God’s will. He will take care of you. Even when your life pray life is hard. He will not leave or forsake you. Trust in Him. Even when you don’t know what to pray or how to pray. Trust. His grace is sufficient. And through Him, just as He did, we will triumph.